The technical assistance of the supplier is therefore a key factor to prevent possible errors during the implemention phase of the work, and to find the most suitable solutions in case structural defects are found during infrastructural construction works. So it happened, as an example, to the forefront project of the Skyline 18, , a building value of over 50 milion euros, dominating the city of Brescia from end 2013. The combination of quality and design in every aspect of the project has been possible by choosing the Orsogril grating. In addition, Nuova Defim Orsogril has provided a fundamental service by delivering several lots of gratings, each customized according to type, dimension and loading capacityfrom the pedestrian (Class 1) up to the heavy loads (Class 4). 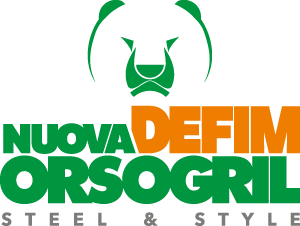 The commitment was not however limited to the planning of deliveries, in addition an on site technical survey involved directly the Technical staff of Nuova Defim Orsogril who – the only providing this service in Italy – specializes in supporting the customer during the initial phases of the works (on site measuring), thus resulting into customized information on the best appropriate solutions. Skyline 18: the project "phases"
The meeting between Nuova Defim Orsogril and the customer has highlighted the specific requirements of the project and enabled to proceed with a first draft and a related technical proposal. Electro welded grating GES #22x76 -80x3: Complying with load requirements Class 4, passage of long-vehicles total floor mass (static), up to 45.000 kg dinamic load 9000 daN on imprint 600x250 m, supply of gratings with frameworks. Press grating GP #22x66 -110x4: Complying with load requirements Class 4, passage of long-vehicles, total floor mass (static), up to 45.000 kg dinamic load 9000 daN on imprint 600x250 m, supply of gratings with frameworks. The press grating was retained since it was not possible to place any intermediate support. Electrowelded grating GES #22x76 -50x3: Complying with load requirements Class 2, car passage only, total floor mass (static), up to 3.000 kg dinamic load 1000 daN on imprint 200x200 mm, including frameworks, beams and brackets. Electro welded grating GES #15x76 -40x2: Complying with load requirements Class 1, pedestrian passage only, dinamic load 600 daN/m2, including frameworks, beams and brackets. Once the proper technical solution has been approved, the Technical staff has carried out an on site survey and measuring to prevent any error, and therefore to be able to proceed with the correct supply of the various scheduled lots according to each different area to be covered. The site inspection allows to highlight some technical solution and prevent from any possible problem. In this case the technical staff could detect the absence of intermediate supports to hold the gratings in concrete and they could promptly point it out. Once measured, the project is engineered and the entire production chain starts : from the raw “matrix” panel (Gea mat) to the finished , individual marked grating panels. During stage n. 4 the banding/framing of the panel is made through a complete automated process (SCT), without using any additional weld material. The Skyline 18 project is at the end. Nuova Defim Orsogril gratings have been correctly installed and are ready for their use.